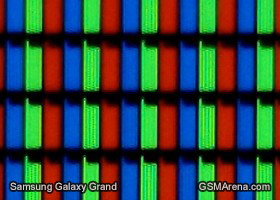 We've gone over how the WVGA resolution of the Galaxy Grand Neo stretches rather thin on the large display, resulting in a less than optimal 186 pixels per inch. Nevertheless, for a budget-range device you still get excellent colors and decent viewing angles. The 5-inch display also makes for some superior usability compared to smaller 4-inch offerings, as on-screen keyboards and buttons feel markedly less cramped. Overall, the contrast leaves something to be desired, and is worse than the one found on the original Galaxy grand. Sunlight legibility comes in about the same - towards the bottom of the chart. 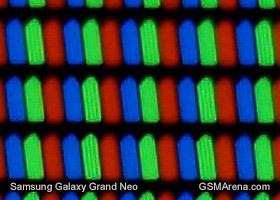 When we put the pixels of the Grand Neo under our digital microscope we can see where the differences come from. While both devices have the same inline RGB panel, the ones on the Neo are shaped differently and slightly tilted. 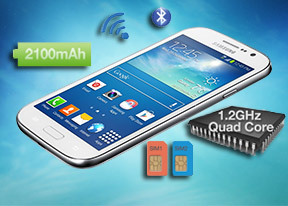 The Samsung Galaxy Grand Neo handles well in large part to the pleasantly-textured matte finish on the back panel. Unlike the glossy plastic finish found on most budget Samsung droids, the back panel makes the device comfortable to hold in hand and is highly resistant to fingerprints. Our only complaint when it comes to the Grand aesthetics is that the design language has been used by Samsung for almost two years now and has only been losing its appeal. Not to mention you would have a hard time telling some of their midrange smartphones apart just by looking at them. It deserves a point deduction for its complete lack of character.